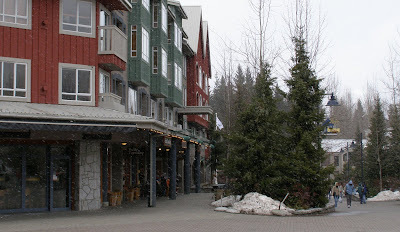 When you aren't on the mountain, it's fun to walk around Whistler village. We did the requisite souvenir shopping; tshirts and hats for the boys, a fleece jacket for me. If you go, make sure you look around before you buy. We got some great deals by checking out sales and clearance racks. My favorite souvenir is the Christmas ornament I found at Smile Gifts. We try to find interesting ornaments on all our family trips. When we decorate our tree, it's fun to remember the places we've been. Our breakfasts and all but one dinner were provided by the host of Doug's work conference. 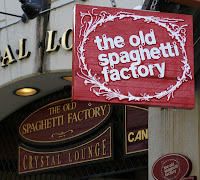 For that one dinner, we ate at The Old Spaghetti Factory, a recommendation from Jas on Through the Lenses. All the entrees include soup or salad, sourdough bread and spumoni ice cream. We ordered Spaghetti with Spicy Meat Sauce, Baked Tortellini with Meat Sauce, Seafood Linguine Marinara, Seafood Fettuccine Alfredo, and the Penne with Chicken. All the dishes were very good, but my penne was the best. Connor disagrees, and claims his baked tortellini was the best. It had a thick layer of cheese baked on top, and I think he inhaled it. The bread with whipped garlic butter was delicious, too. One day, after the mountain shut down, Doug and I left the boys with their homework, and went into the village for a beer. We ended up sitting outside at Black's Pub, sharing a pitcher of Cypress Honey Lager and an order of chips and salsa. The Honey Lager is from the Granville Island Microbrewery in Vancouver, and is similar to Wisconsin's Leinenkugel's Honey Weiss, but a little more bitter. They also had Gastown Amber Ale, and if we didn't have to get back to the boys, I would have liked to try it.